Background: Perineal approaches have been preferred for the treatment for full-thickness rectal prolapse in elderly patients despite a higher incidence of recurrence when compared with open abdominal approaches. However laparoscopic rectopexy with or without resection may also be used for elderly patients. Purpose: Therefore, the aim of this study was to evaluate safety and effectiveness of laparoscopic rectopexy compare to perineal rectosigmoidectomy for full-thickness rectal prolapse in elderly patients. Methods: Between July 2000 and June 2009, eight consecutive patients (8 female; mean age 71.0, range 65-77 years) with full-thickness rectal prolapse underwent laparoscopic rectopexy. In the same period, 143 patients underwent perineal rectosigmoidectomy. Thirty-five age-matched patients were selected (35 female; mean age 73.8, range 66-79 years). Results: Three patients (37.5%) in the laparoscopic rectopexy group and 13 patients (37.1%) in perineal rectosigmoidectomy group had previous operation history for rectal prolapse. Mean follow-up period were 7.2 months (range 1.0 ~ 15 months) and 15.9 months (range 0.1 ~ 85.9 months), respectively. In the laparoscopic rectopexy, operation time was longer (116.5 vs 77.4 hours, p < 0.05). But, hospital stay was same in both groups (4.4 vs 4.5 days, p > 0.05). Postoperative complications were one included an incisional hernia in laparoscopic rectopexy group (12.5%) and three (8.6%) included acute renal failure (1), urinary retention (1) and one anastomotic leak in perineal rectosigmoidectomy group.. Recurrences were 2 (25%) in laparoscopic rectopexy group and 4 (11.4%) in perineal rectosigmoidectomy group. 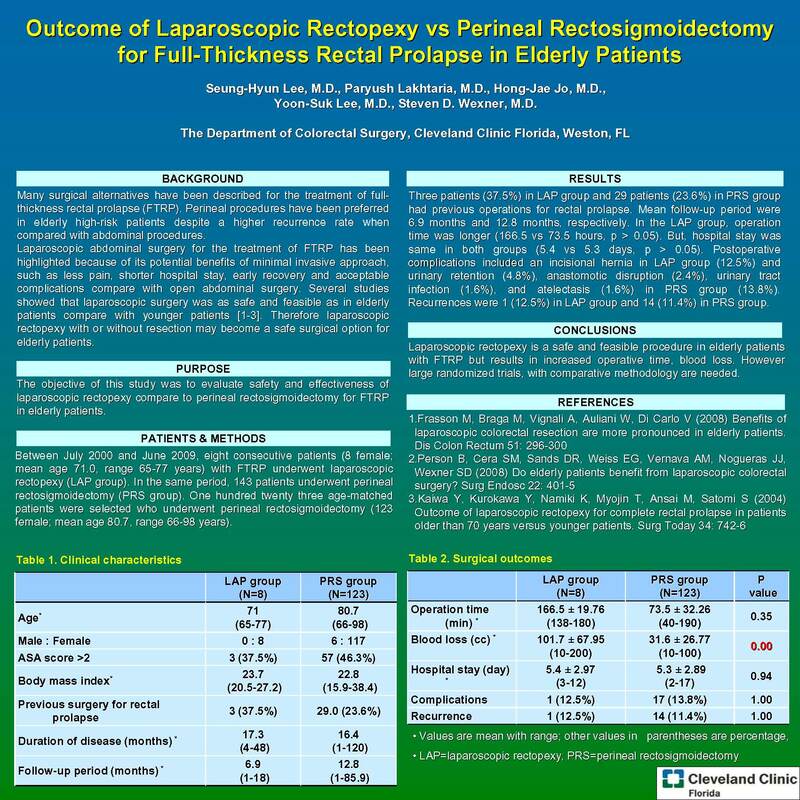 Conclusion: Laparoscopic rectopexy is a safe and feasible procedure in elderly patients with full-thickness rectal prolapse but results in increased operative time, increased postoperative complications, and higher recurrence rate as compared to perineal rectosigmoidectomy. However large randomized trials, with comparative methodology are needed.